Tonight I sit here on the couch with my mom cracking up as we watch cooking shows and crunch on homemade popcorn balls. It's a special night. Just the two of us. We made dinner together and sat down to watch our favorite fall movie, Arsenic and Old Lace as we had a bowl of this Indian dish. I got this recipe from Rachel Ray. This vegan recipe is fun, healthy and very easy to make! In a Large bowl, mix the flour and 1 t. salt. In a small skillet, heat 2 T. of the vegetable oil over high heat until very hot, about 1 minute. Drizzle it over the flour mixture. Pour in 1/2 cup water in a slow streamm, mixing with a wooden spoon. Add up to 2 T. more water, 1 at a time, until the dough hold together when pinched. Working by hand or using a standing mixer fitted with a dough hook, knead the dough until smooth and firm, about 10 minutes by hand or 5 minutes by mixer. Cover and let rest for 10 minutes. In a large skillet, heat 2 T. oil over medium heat. Add the onion and cook, stirring occasionally, until beginning to brown, 10-12 minutes. Add the chiles, garlic, ginger and garam masala and cook for 30 seconds. Add the tomatoes, half of the cilantro and 1/2 t. salt. Simmer gently until saucy, about 5 minutes. Stir in the chickpeas and simmer for 10 minutes. Stir in the lemon juice. Cover and set aside to keep warm. Divide the dough evenly into 8 balls. Roll each ball into a 6" round (about 1/16" thick). Cover with a damp cloth or plastic wrap. Meanwhile, wipe the inside of a medium nonstick skillet with an oiled paper towel and heat over medium heat until hot but not smoking. Working with 1 dough round at a time, place the dough into the pan and cook until brown in spots on bottom, gently pressing the air bubbles with the back of a spatula to expel the air, about 30 seconds. Flip and continue pressing for about 15 seconds. Transfer to a plate and brush with some of the butter. Repeat with the remaining rounds and butter. To serve, spoon the chana masala into individual bowls. Top with the remaining cilantro and the lemon wedges (or lime). Serve with the roti (bread). Looks amazing huh? It sure was. We sat there, snuggled up on the couch enjoying each bite. We ended up sprinkling the roti with a little sea salt. That really kicked it up. The chana masala was perfectly spicy and the chickpeas gave it a great bite. Feel free to use only 1 or even less peppers. Or get creative and use any pepper or add veggies. If you add more veggies, I would add more tomatoes so you have plenty of "sauce." It was a perfect fall dish. Felt good to have a healthy, yet satisfying meal. Every year I look so forward to going to Jerry Smith Pumpkin Farm. We walk through all the displays as we snap shots of each other in the scenes, feed the goats, pick out a perfectly wonderful pumpkin, and get some of their amazing sugar cookies on the way out! This time I decided to get a pumpkin I could cook with, a sugar pie pumpkin. I had yet to bake one myself. I've always used canned pumpkin. Until now. An adventure is about to begin.. I brought the dirty pumpkin home, scrubbed it and whipped out a recipe from Rachel Ray that I've been wanting to make for too long. It's called Penny-Wise Pumpkin Pasta. The name comes from it's low budget ingredients, supposedly. The recipe called for a 15-oz can pure pumpkin puree, so I had to figure out first how to roast this thing. I googled and found super easy and effective instructions, here. This is how my pumpkin turned out! Now time to make this pasta! While the pasta is working, in a medium skillet, heat the oil, 2 turns of the pan, over medium heat. Add the shallots and garlic and cook until softened, about 5 minutes. Stir in the broth, pumpkin and cream/soy. Add the hot sauce, cinnamon and nutmeg; season with salt and pepper. Lower the heat and simmer until thickened, about 5 minutes. Stir in the sage. Toss the pasta with the sauce and pass the "cheese" around the table. This pasta was delicious. I think it could easily be tweaked and altered if needed. I actually used yellow onion instead of shallots. It was easy to make. So, thoughts on roasting the pumpkin? Well it was easier than I thought but didn't have a huge amount of more flavor than canned. But I loved the texture it gave. I would do it again though. I served this pasta with homemade garlic bread. You can find the recipe here. This time I used vegan margarine instead of oil and cooked chopped sun-dried tomatoes with the garlic. It was a very yummy change. I can't wait to watch the movie Arsenic and Old Lace! Been so in the mood! What are you doing this fall? I've really been in the mood for some good old marinara sauce. 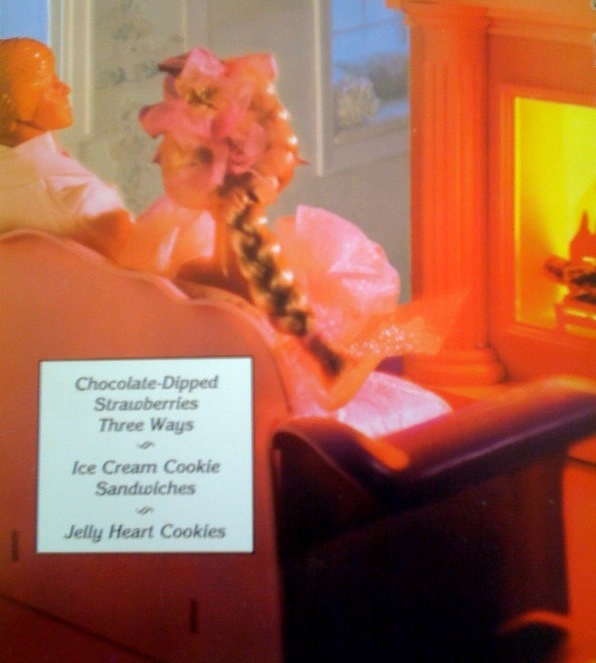 I think my first cookbook was The Barbie Party Cookbook. I don't even know how old I was but I remember making the spaghetti recipe in there and my family really liked it a lot. So for years my mom and I have used this marinara sauce recipe. The cookbook is hilarious to me now! 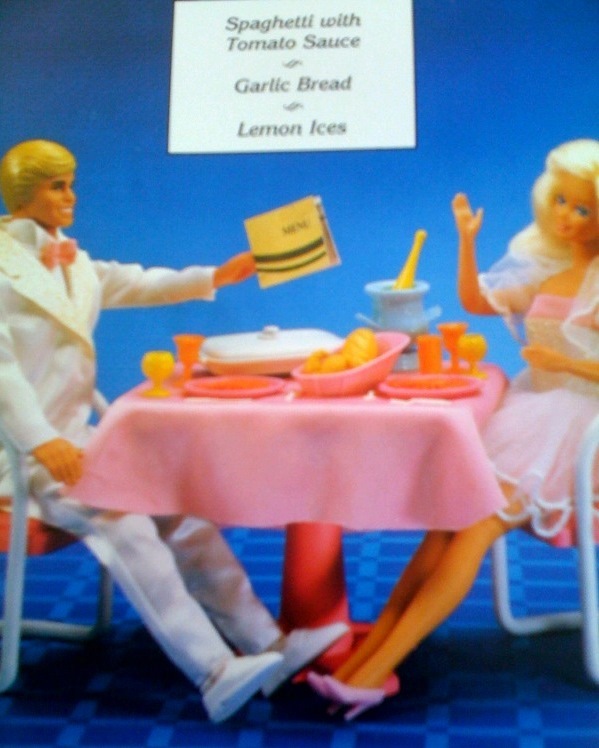 Ken is featured in romantic scenes for the Valentines Day recipes. I believe Skipper is skiing in the winter section with hot chocolate. As the years have passed I basically stopped looking up the recipe and have kinda made it my own. For a while I've wanted to try one of the many eggplant recipes I have and I just happened to have an eggplant on hand I wanted to use. I found this recipe in Rachel Ray's magazine, who I like a lot but I personally like to cook from scratch, so I adjusted some things. Season the eggplant with salt and pepper. In a wide, shallow bowl, whisk together the eggs and 4 T. of the pesto. Pour the bread crumbs onto a large plate. Dip each eggplant slice into the egg mixture, then coat with the breadcrumbs. Preheat the oven to 350°F. In a large nonstick skillet, heat 2 T. olive oil over medium-high heat. Working in batches, cook the eggplant until golden, 2 minutes on each side, using the remaining 4 T. olive oil if needed. Transfer the eggplant to a paper-towel-lined baking sheet. In a small bowl, combine the ricotta and 3 T. grated cheese (or nutritional yeast); season with salt and pepper. Spread 1 T. of the remaining pesto on each eggplant slice and top with about 2 T. of the cheese mixture. Roll up each slice. Place them in a casserole dish and bake until the eggplant is tender when pierced with a toothpick, about 10 minutes. Meanwhile, in a small saucepan bring the marinara sauce to a simmer. Serve the roll-ups with the sauce and remaining grated cheese. And lastly, here's Barbie's recipe for the marinara sauce. Heat oil in a large sauce pan. Add the garlic, onion, salt and pepper. Cook over medium heat, stirring occasionally with a wooden spoon, until onions are soft. Pour in the tomatoes, oregano, and bay leaves. Cook, uncovered, at a low boil or simmer for 15 minutes. With a slotted spoon, remove bay leaves before serving. Homemade pizza for a friend's baby shower.. I ran to the store, bought all kinds of veggies including butternut squash, red and green bell peppers, yellow squash, zucchini, red onion, broccoli and garlic. Chopped it all up and roasted it with EVOO, sea salt and cracked black pepper until it was nice and caramelized. The home was decorated beautifully with glossy silverware, darling placemats, organic grapes to snack on and of course lovely tunes like Over the Rhine filling the room with a calm, unpretentious ambience. I loved that it wasn't a typical baby shower with the same old games no one wants to play. Instead we had great conversation, took turns getting facials & hand massages from 2 lovely ladies for an affordable price.. it was a relaxing and fun night for everyone! And lastly, the food was delicious. Tahmi, the hostess, prepared a tasty spinach salad with roasted beets, walnuts, and goat cheese. The shower was a success, the pizza was well received and most importantly, Ro was thrilled! It was a great night. If you are interested in having a Chef Teebs' pizza at your next party, drop me a line! I'm really excited about fall. I just went through my huge binder of recipes to pull out all my warm and cozy recipes. I hope you enjoy pumpkin, acorn & butternut squash, soups, roasted veggies and lots of spices because I got some yummy recipes I'm looking forward to trying! This particular recipe was amazing! Lentils are loaded with fiber and protein. I served this spicy, savory dish with short brown rice and a side of steamed carrots tossed in a garlic-ginger "butter." This recipe is from Cooking Light. Heat 1 t. oil in a large skillet over medium heat. Add onion to pan; cook 2 minutes or until charred. Carefully turn over onion and cook an additional 4 minutes or until blackened and charred. Remove from heat. Coarsely chop; set aside. Combine mustard seeds, coriander, cumin, and clove in a skillet over medium heat. Cook 1 1/2 minutes or until fragrant, stirring frequently. Remove from heat. Combine with cinnamon, cardamom and red chile. If using whole seeds, use a spice or coffee grinder and pulse until ground. Heat remaining oil in a small dutch oven over medium heat. Add ginger and garlic to pan; saute 1 minute. Stir in spices; saute 1 minute. Add broth, lentils, and tomato to pan; bring to a boil. Cover, reduce heat, and simmer 30 minutes, stirring occasionally. Uncover; add onion and cook 10 minutes. Stir in cilantro and juice. 5-7 carrots, peeled and cut into "coins"
Steam carrots, covered, 10 minutes, or until tender. Heat butter in a large skillet over medium heat. Add garlic and ginger to pan; cook 1 minute, stirring constantly. Remove from heat; stir in carrots, cilantro, and remaining ingredients. I obviously altered it here and there according to what I had on hand and of course to veganize it. I really feel a difference in my body by taking out the animal products in food. I don't feel that yucky weighed down feeling after eating and I feel just better in general. My parents really enjoyed this meal. We all loved the lentils. The carrots were a nice change and complimented the lentils very well. The carrot recipe wasn't outstanding. But I am going to keep it when I want something different than the usual way of preparing carrots. I still thought they were tasty! I also served some homemade dinner rolls my mom had made the night before. Yum! I just bought a sweet pumpkin.. so get ready for something good to come. I'm going to make dinner with it! The tacos were pretty good. But the recipe was useless to me. So I threw it back in the garbage. I'm sorry. But I did make delicious roasted acorn squash along with it. Here's the recipe for that.. Simply line a brownie-style pan with foil and place squash slices in pan. Top with dabs of butter and a generous amount of brown sugar on each slice. Bake at 400°F for about 30 mins or until tender and toasty. This recipe is perfect to warm you up on a chilly day. I think what happened with the peppers is I probably should have rotated them as they were cooking. It seems like they were scorched in some places and raw in others.. I never have this problem with bell peppers so I was surprised. Anywho, I'll wear gloves next time!